I think it's because pears are the colors I look good in; or maybe because they taste wonderful at the peak of ripeness, sweet and juicy. All I know is I love pears! A prophet is defined as "a person who speaks with divine inspiration; a person who foretells future events." We have been called to difficult tasks in a difficult age, but this could be for each of us a time of high adventure, of great learning, of great inner satisfaction. For the converging challenges posed by war, urbanization, dilution of doctrine, and domestic decay surely provide us the modern equivalent of crossing the plains, enduring misunderstanding, establishing a kingdom throughout the world in the midst of adversity. I pray that we may do our part during the journey, and be with, and leading, the caravan of the church as it enters the final chosen place--His presence." I'm grateful for prophets, ancient and modern, to lead and guide us in following the Savior back to our Heavenly Home. I'm so thankful for those who make really good movies. Steve and I went to see it tonight and were inspired. I slept in today and the only chore I did was clean the kitchen. We got four letters from Mr. Movie, currently away at Army Recruit Training, I read a novel, and looked up a few things online. Sometimes a mom just needs a day of rest! TopDad is taking me out to dinner and a movie tonight. Yesterday and today gave my kitchen appliances a workout. I'm thankful to have them. I'm grateful they work properly. I love Thanksgiving; I enjoy making dinner for my family. One month until Christmas! I'm grateful for online shopping and home delivery service of the United States Postal Service, United Parcel Service, and Federal Express for their "speedy delivery" services. We had the privilege of attending a Presidential candidate forum last Friday in Des Moines. After the forum we attended a meet and greet with Senator Ted Cruz. I had read his book A Time for Truth in early July and was eager to have him sign my copy, which he did graciously. We got to shake his hand (I was first!) and hear him present his vision for America. We support him! I'm grateful for honest, patriotic leaders who stand for principles no matter what. I love music and when my spirit needs a lift I listen to the Mormon Tabernacle Choir. Today I completed the final preparations for both a Sunday School lesson for the youth and a talk in Sacrament Meeting tomorrow. The internet in general, and the church website lds.org are such a valuable resource and blessing to me. Frequently I thank God for the miracles of technology that make life so much easier. Last night I was so tired that I got into bed at 9:20 PM, read for a while, and turned the lights out at 10:00. This morning I felt truly rested when the alarm went off. Speaking of which, I'm so thankful our daughter found an alarm clock with birdsong to wake me up. It's so much more pleasant than the obnoxious beep of my former clock. A good night's rest leading to waking up refreshed is truly a blessing. I love getting mail! Thank you dear friend in Spring Valley who mailed me a handwritten card! I am home alone most days now. It is restful to my ears. I enjoy the quiet and solitude. I can hear the whisperings of the Spirit more easily in the quiet. Can I get an Amen! on being grateful for the Sabbath Day? Thank you. I couldn't make it through the weeks without a break and rest from the cares of the world, and the spiritual nourishment of going to church and worshiping with like minded people. Today I'm grateful, as always, for rain. I enjoy rainy days, especially because I can stay home and do things like put on a quilt, make soup and cornbread, and otherwise exercise my homemaking skills. Having worked outside the home for a while I have compassion for all women who are forced by circumstance to do that; while at the same time I don't really understand the women who choose to leave home and family to work, but that's okay, the freedom to choose ones path is a blessing. I'm a homebody and like being able to set my own agenda and schedule for the work that gets done. I'm so grateful for my Dandylion. When he was given a name and blessing, my husband said "I bless you to always be a comfort to your mother." And he has been. He is a cuddler, smart, artistic, a great conversationalist, funny, sweet and wonderful with music in his soul. I suppose it is fitting that on Friday the Thirteenth our local high school put on its fall play "The Walking Dead" based on the television show of the same name. Our son, Dandylion, played Dr. Jenner at the CDC in Atlanta. He did a great job. But the play as a whole was, well, horrible. The English teacher, new to the school this year, wrote and directed the play. I told TopDad that I am extremely grateful Dandy is our youngest and we don't have to support any more garbage like this. At the play the students in the audience were cheering and applauding wildly. I was totally disgusted. Not only was the subject matter awful, the play was full of swearing and using the Lord's name in vain. If this is what passes for entertainment we are in far worse shape as a nation than I thought. For myself I'm so grateful for the Light of Christ, for the gospel, His grace, love and mercy. I'm thankful for the hope of a better world. January 12, 1888 began as an unseasonably warm morning across Nebraska, the Dakotas, and Minnesota, the weather so mild that children walked to school without coats and gloves. But that afternoon, without warning, the atmosphere suddenly, violently changed. One moment the air was calm; the next the sky exploded in a raging chaos of horizontal snow and hurricane-force winds. Temperatures plunged as an unprecedented cold front ripped through the center of the continent. By Friday morning, January 13, some five hundred people lay dead on the drifted prairie, many of the children who had perished on their way home from country schools. In a few terrifying hours, the hopes of the pioneers had been blasted by the bitter realities of their harsh environment. Recent immigrants from Germany, Norway, Denmark, and the Ukraine learned that their free homestead was not a paradise but a hard, unforgiving place governed by natural forces they neither understood nor controlled. The Children's Blizzard, by David Laskin is a fascinating true story, heart wrenching, and heart warming. I highly recommend it. We are so blessed to have high tech weather forecasting, and rapid dissemination of those forecasts through radio, television, internet, even phones. Yesterday a violent storm passed through our area. We were under a tornado watch in our town, and just north of us where our daughter was working a tornado warning. I'm grateful for the miracles of technology that keep us safe. Iowa is the only place I've ever lived where the weather has the ability to make me feel nervous. The Marine Corps birthday was yesterday, November 10, they turned 240 years old! Today is Veteran's Day when we honor those served, and especially those who died while serving our country. I am grateful for all who serve in the military to protect us and our liberties. "Lt. Lehi's" USMC Graduation 2014 - He's the second one from the left. Last night we got a phone call from a full-time senior missionary at Ft. Sill, Oklahoma, telling us that our son had attended church that day on base where our son is at Army Recruit Training. The Elder told us that our son is doing well and sends his love. What a sweet man to take the time call us and let us know he'd seen our son. We talked for about 15 minutes and found that he and his wife have much in common with my husband and I. We look forward to meeting them when we go to Mr. Movie's graduation. My parents served three full-time missions. First to Spain, Las Palmas, which is the Canary Islands; then to Portugal Lisbon North; then they served a year at the Family History Center in Salt Lake City. Our family was so blessed by their service. Now my oldest brother and his wife are preparing to serve in the Michigan Lansing mission, leaving January 4, 2016. Exciting times for them. We Thank Thee, O God, For a Prophet! 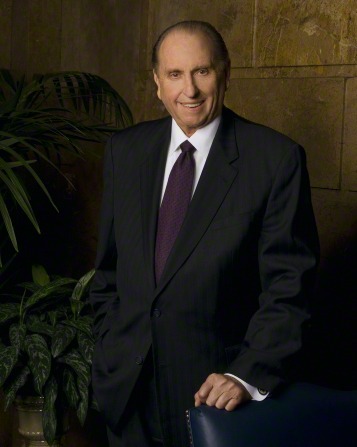 With the world in commotion on almost every topic under the sun, I'm so grateful to have a living prophet on earth to lead and guide us on the path of righteousness following the Savior. When The Family: A Proclamation to the World was read in 1995 at the Relief Society General Broadcast, I wrote my feelings of gratitude in the form of a hymn text. Of famine, drought, and sword. The Lord, our prayers has heard. These words fit the tune of God Moves in a Mysterious Way, Hymn # 285. Twenty years later my gratitude has grown a hundred fold. Some of my favorite people live in a fictional town called Mitford. I am so thankful for Jan Karon's writings. She is one of my most beloved authors. I wish I could meet her and give her a big hug. In the midst of everything else I'm doing this month, I'm escaping to Mitford for the latest story about Dooley and Lace's wedding. Her writing is so good I feel like I'm there with them. If you haven't met Father Tim and Cynthia, Dooley and Lace, and all the other true to life characters in her books you are missing out. Maybe I love them so much because I served a mission in the south and they are just like people I met; or maybe it's because I can trust her writing to be clean, realistic and full of uplifting faith. Most likely it's all of that and the fact that most of my adult life I have lived away from family and friends so I turn to my fictional friends for company and comfort. Here's to good friends, both fictional and real! As my advancing years wreak havoc on my brain power, I increasingly rely on To Do Lists so I can remember and stay focused on what I want to accomplish each day. Actually, I don't think it is a problem of advancing years, it really is a problem of getting distracted by all the goodies on the internet. I do, however, rely on lists; and the latest incarnation is simply an 8 1/2 x 11 piece of scrap paper and a black sharpie. I write down what I need to do and want to do, then hang the paper on the cupboard nearest the stove so I can see it all day (I'm in my kitchen/dining room/office a lot all day) and as I finish one task I check it off and see what is the next thing to do. I'm really thankful for ideas and inspiration that help me be more productive in my job as wife, mother, and homemaker. We are never to old to learn new tricks! My sweetheart daughter, Noble, assisted me with more leaf raking yesterday. I'm so thankful for her youthful strength and vigor. Together we got loads more done. Have I ever said how much I love bread? Oh, how grateful I am for the staff of physical life. I'm thankful my mother and her mother made bread and left recipes and instructions. I LOVE bread. I spent an hour this morning raking leaves from our almost century old maple trees. Did you know, as I didn't before moving here, that maple leaves have a sweet fragrance about them when they first fall? I love that smell! I also love the colors of the leaves; red, orange, yellow; some with streaks or spots of green still showing. They are just lovely. I'm grateful for the heart gladdening and soul enlivening sights and smells of autumn leaves. Friday the washer went out. Wouldn't you know it, just as I wanted to do a load of bath towels. The hot water worked, but not the cold. I checked all the connections but couldn't determine the problem. I let my husband know and he gave me permission to look at new (to me) washers. I looked but couldn't find what I want, because frankly I don't know what I want among all the new-fangled models. When TopDad got home he looked things over and found the problem, looked up the part number and where to get it, ordered it, paid for it and told me I could pick it up on Monday, he'd fix it Monday night. I'm really grateful for a husband who has been willing to learn to be a handyman. He didn't start out that way, but slowly over the years, with lots of encouragement, he's done wonders at saving money for our family by fixing things, building things and maintaining things. A perfect beginning to a new month--light in the morning. I wish we could stay on standard time all year long because I'm grateful for the sunshine in the morning to help me wake up. This is the beginning of Count Your Blessings during the month of November. I hope you'll join me in looking for and counting our many blessings during this month of Thanksgiving.